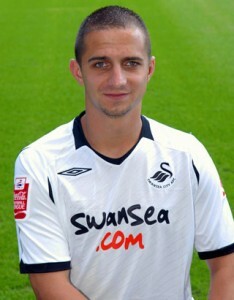 Very few Swansea City fans will not be familiar with the name of Ferrie Bodde. The Dutch midfielder joined the Swans for £50,000 in June 2007 from from Dutch Eredivisie side ADO Den Haag and was to be a key acquisition for Roberto Martinez’s side. The signing also strengthened the bond between fans of the Swans and the Dutch side – none more so than current Swans director and lifelong ADO Den Haag fan John van Zweden. Ferrie made his first competitive start for the Swans at the start of the 2007/2008 season in the opening day League One defeat at Oldham Athletic but had to wait until October of the same year before opening his goal scoring account with the winning goal at Huish Park as the Swans beat Yeovil 2-1. The feisty midfielder quickly made a reputation for himself at the Liberty Stadium as a tough tackling but skillful player at the hub of the Swansea midfield. His two sendings off during his first season at the club showed a more reckless side to his game – against Doncaster Rovers for an alleged headbutt and against Leeds United for an alleged stamp. Consequently, the Jack Army were quick to give him the ‘Evil Genius’ tag. Bodde wasn’t a dirty player however and his playing ability was proven by his inclusion in the PFA League One team of the year for 2007/2008 as he helped the Swans to the League One title and promotion to the Football League Championship. The Swans return to the 2nd Tier of English football for the first time in 24 years saw Bodde maintain his excellent form with 7 goals in just 17 Championship appearances – including a wonder goal away at Preston North End. Sadly for Ferrie and the Swans, his season was over in November 2008 as the Dutchman ruptured his cruciate ligament playing against Birmingham at the Liberty. In September 2009, some 10 months later, Bodde returned to the Swans starting line up against Sheffield United at the Liberty but lasted less than 10 minutes after feeling his knee “click” and was quickly substituted to avoid further damage. He spent a further five months on the sidelines building up the strength in the knee and working on its mobility. Further comeback attempts over a 2 year period, also failed due to problems with the knee and in a horrible twist of fate, Bodde suffered exactly the same injury to his other knee in a reserve match against Arsenal at Parc y Scarlets in February 2012. Unable to recover from his serious knee injuries, Ferrie Bodde was released by the Swans on June 1st 2012 having made 59 appearances and scoring 14 goals for the club. Many people – including chairman Huw Jenkins and former manager Roberto Martinez – were quick to pay tribute to the midfield maestro from Holland. Almost everyone was in agreement that he was one of the best players in the Championship and that injury had stopped him from displaying his talents in the Premier League. Despite attempts to resurrect his career at ADO Den Haag and then Wigan Athletic – Bodde was never able to recover from his cruciate ligament injuries and faced yet further knee operations. Ferrie always remained close to the hearts of the Jack Army though and none more so than when the Dutchman was put in an artificial coma after being taken seriously ill with a lunch infection in April 2014. As fate would have it, the 31-year-old woke on the day the Swans paid their own special tribute to him when they hammered Aston Villa 4-1 at the Liberty. During the 6th minute of the game (Ferrie’s shirt number), the LED advertising boards at the Liberty flashed up with Ferrie’s name and the words ‘Once A Jack, Always A Jack’ sparking chants of “One Ferrie Bodde, there’s only one Ferrie Bodde” from the Jack Army. The club, players and supporters mean so much to me. What they did during the game was unbelievable and I will be eternally grateful. Thankfully Ferrie made a complete recovery and nowadays can be found as head coach of the Dutch amateur club SV Wateringse Veld. Wij zullen je nooit vergeten je Ferrie.